You need stronger legs to Pitch than we thought!!! We all know that you need strong legs to pitch but a new study, which isn’t even published yet, is telling us that they need to be stronger than we originally thought. 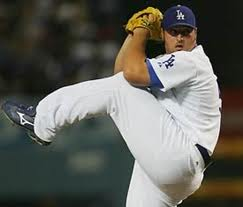 Jonathan Broxton, now with the Royals, needs his big tree trunk legs to handle his big frame (6’4″ – 295lbs) and produce his big fastball. As always I will break down the geeky science then provide you with some practical applications that you can use to improve your game. Authors: John A. Guido, Jr and Sherry L. Werner. Before we get into the nitty-gritty details of this study let’s do background work. Ground reaction forces are basically the amount of force that is exerted back to your body from the ground which is equal and opposite to the amount of force that you put into the ground. During a jump you push your feet into the ground and this force is redirected back up allowing you to get off the ground – the more force you put into the ground the higher you will jump. But if you want to be able to jump higher than you can now you need to get stronger so that you can put more force into the ground. Ground reaction forces are measured in different directions. If you jump straight up you will be exerting vertical ground reaction forces. If you are running the majority of the forces being produced will be horizontal and when you need to slow down you will need to apply whats known as anterior or braking forces. What this study did: This current study used 14 college baseball pitchers who were on average 175lbs and 5’10” and threw 78mph. They had each pitcher throw 10 fastball strikes from a mound with a force plate built into it in order to measure the amount of force being put into the ground. They also filmed each pitcher during their deliver to figure out exactly when these forces where being produced during their delivery. This current study did not measure the forces being produced by the back leg like the one that MacWillams performed back in 1998. 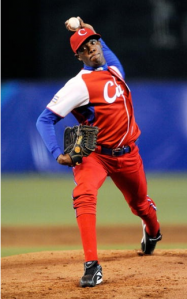 If you want to learn more about the MacWillams study which concluded that more force being produced by the back leg translated into more throwing velocity check out this article that I wrote back 2010. What they found out: The main finding of this study were that the ground reaction forces in an anterior or braking direction where approximately 245% of body weight whereas the MacWillams study only reported these forces to be equal to about 72% of body weight!! This is a huge difference. The reason for this discrepancy might be that the pitchers in the current study threw harder and where bigger than in MacWillams study which did not report either. One of the main reasons the authors decided to perform this study was that there was only one previous study which measured in baseball players and it is a good thing they did. Gagne’s front leg is about the apply the brakes!!! The anterior or braking forces are very important to throwing velocity from a pitching mechanics point of view because it stops the forward momentum created by the back leg allowing the energy to be transferred from a strong and stable position. If you land and your front leg continues to move forward you won’t be able to transfer energy as efficiently and what’s known as an energy leak will occur. Energy leaks are bad – you want to transfer as much energy as possible from the lower body to the upper body as possible in order to throw gas. Here is an another article I wrote discussing the importance of front leg strength. 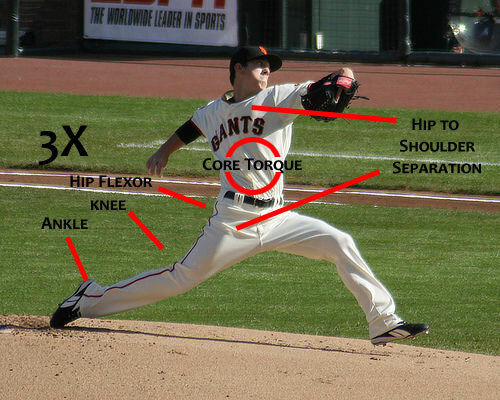 Basically it states that pitchers who landed with their front leg bent/flexed and continued to bend/flex throughout the rest of the delivery didn’t throw as hard as those pitchers who had the strength to land with a bent/flexed leg and then straighten/extend this front leg throughout the pitching motion. This video of Justin Verlander demonstrates his great front leg action allowing him to efficiently transfer energy and strike out hitters. In regards to vertical ground reaction forces this current study reported forces of approximately 200% of body weight while the MacWillams study reported only 150%. The vertical forces are important because we need to transfer this energy up the kinetic chain. What you can do: The authors of this study were nice enough to provide an exercise which they thought might be beneficial to help players get strong enough to handle the forces needed to achieve higher throwing velocity. The exercise they suggest is basically a lunge where you start standing tall and balanced on one leg. You then fall forward and catch yourself with the opposite leg and immediately try to push yourself back up the starting position. The way they describe this exercise is much like a plyometric exercise where you try to minimize the amount of time your front foot stays on the ground. 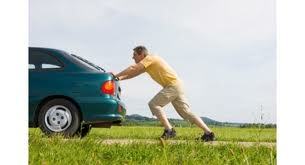 The speed and velocity that you push yourself back up is very important and when that begins to slow down you stop. However this exercise can also be done with weights which will allow to work on absorbing more force but you won’t be able to push yourself back up as explosively. 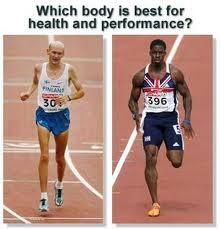 Both have their place on what is known as the strength velocity curve. Ideally you focus on the weighted version during the off-season in the weight room and then use that strength you’ve built up to make the plyometric version even more explosive. Stick to reps between 4-10 per side with both the plyometric and weighted version for 3-5 sets. 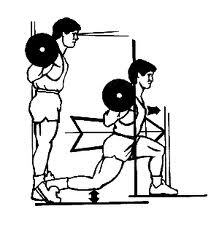 Even though you always land on the same leg when you throw it is very important to do the same amount of reps for both legs. In fact it might even be a better idea to do more reps on the leg you don’t land on (right leg or righties) because of the fact that you do so much landing on the other leg every time you pitch or throw. Where is an example of basic forward lunge. The study in question today comes from the Dr. Andrews lab in the American Sports Medicine Institute in Birmingham, Alabama. If the pitching practices of adolescent (14-20yrs) pitchers that DON’T have any history of arm injury are different then adolescent pitchers that DO have a history of arm problems. The goal here is to identify common factors that most pitchers with injuries have in common and compare to no injured throwers in order to find out which ones may contribute to arm problems which nobody wants. How tall and heavy are you? How many innings do you pitch? How many months out of the year do you pitch? Your coach cares most about? the game, the season or your career? Do you exercise for baseball? Do you ice and/or stretch after you throw? If you come out of the game as a pitcher do you stay in and go to another position? Out of 10 pitches how many are fastballs, breaking balls, change ups? Do you use anti-inflammatory drugs? How old were you when you started to shave? And many, many more questions like this. The significant differences between the groups were that the injured group pitched more months per year, games each year, innings per game, pitches per game, pitches per year and warm up pitches before game. The injured group was also 4cm taller and 5kg heavier on average – there was no age differences between the groups. The injured group averaged 88mph while the uninjured group threw 83mph. Let’s look at some of these factors more closely. While the two groups were very similar in terms of age the injured group was on average 4cm taller and 5kg heavier. At younger ages most pitchers lack the strength needed to handle the forces that come with throwing a baseball as hard as you can so it is no surprise that heavier and taller pitchers have more injuries because they need even more strength. If you’re tall for your age great!! This height will come in handy when you get older and stronger so make sure that your arm is in good shape to take advantage of your long limbs in the years to come. For coaches and parents out there make sure the taller and heavier pitchers don’t over do it. 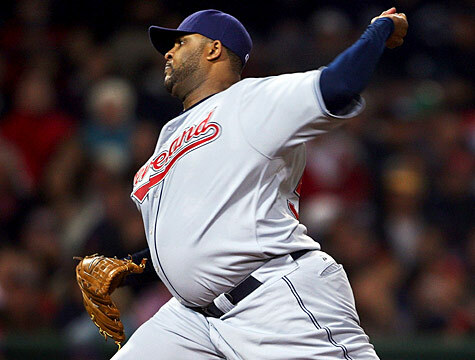 As far as weight goes it can be a good thing because it can add to the total amount of force that you generate and deliver to the ball, CC Sabathia maybe? With added weight comes the need for added strength otherwise the extra mass will work against you. Any weight that you want to add should come in the form of muscle and not junk food. 2. How much, how often and how hard should you throw? It really comes as no surprise that pitchers who threw more often get hurt but we need to throw in order to get better. We need to find out how much pitching there needs to be. One factor that jumped out was the members of the injured group that needed surgery (I would classify this injured) pitched competitively for about eight months a year while the non-injured group averaged only five and half months. Maybe playing on three different teams might not be the greatest idea. It should be noted that the injured group reported average velocities of 88mph compared to 83mph in the uninjured group. While these numbers may not be completely accurate because I am sure that any adolescent pitcher is going to inflate their velocity numbers but at least both group most likely exaggerated their numbers equally. It’s just like basketball players and their vertical jumps, football player’s and their forty times or men in general with their bench press totals. Take them with a grain of salt until you see them. Now hard throwers obviously have to deal with the higher forces needed to reach these higher velocities which can place them a higher risk of injury. Think of Joel Zumaya’s arm problems compared to the fact that Jamie Moyer is still throwing in his 40’s. But hard throwers are more likely to pitch more often since every teams likes to put their hardest throwers up on the bump. Hard throwers are also more likely to go participate in “Showcases” in order to be recruited for higher levels of baseball. While great for exposure these “Showcases” may be doing more harm then good by getting pitchers to max out their arms trying to impress scouts and coaches by throwing as hard as possible in hopes to impress. 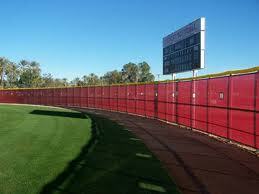 These “Showcases” can be especially damaging when they are held during what is typically the off-season. This not only adds more competitive pitching months to the yearly total but has the pitcher going from a state of no throwing to going all out in order to get that scholarship. Trying to go from zero to hero like this is bad news. If you’re good enough and play organized baseball in the summer scouts will find you so don’t worry about firing up the old pitching arm in winter to go pay someone to go show them what you got. Again this one is not a shocker. 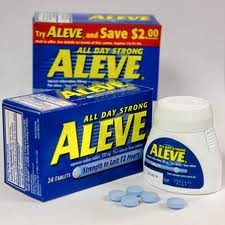 If you need to pop a couple of Aleve’s before you pitch to numb the pain that you know is coming you might what to get your arm checked out. Hopefully you can put this information to good use and help prevent arm injuries from occurring in the first place. 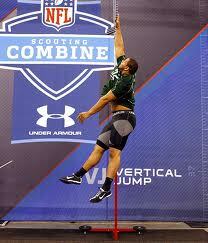 Overview: This research split up their subjects into either high or low velocity throwers based on their…. you guessed it – throwing velocity. They then analysed their mechanics to determine what were the main differences between the two groups in order to find out what allows certain pitchers to throw harder than others. This is a landmark study since they discovered some great information to pass along to anyone who wishes to throw harder and if you are reading this you are probably interested in throwing harder or you know someone who wants to increase their throwing velocity. What they did: They looked at 127 healthy college and professional pitchers and had them throw in their lab with a bunch of reflective markers on specific points of their body in order to determine joint angles and body positions (kinematics parameters). They also used a high-speed camera to determine exactly when each pitcher got to certain joint angles like maximal external rotation during their deliveries (temporal parameters). Of the 127 subjects 29 were classified as hard throwers because they could achieve speeds of 38 meters per second (m/sec) which is 85 mph while 23 were classified as slow throwers that topped out at 34.2 m/sec (76.5 mph). 1 – Physical differences – the hard throwers were signficantly taller (5cm) and had longer arms (4cm). This is just a matter of physics – being taller and having longer arms can allow you to throw harder but it doesn’t guarantee it. If fact having longer limbs means that you have to strong enough to control those long legs and arms. If you aren’t strong enough you will lose potential energy that you could have transmitted into that baseball. They call this an energy leak. 2- Maximum Shoulder External Rotation: the hard throwing group was able to get their arms back into 179 degrees of rotation whereas the slow group could only get 166.3 degrees. Greater amounts of external rotation allows you to throw harder because you generate more of a stretch reflex in your internal rotators which act like springs allowing your arm to rotate forward at an incredibly fast rate. Another reason why more external rotation allows you to throw harder is that you are creating a bigger range of motion which means that you have more time to add force. Your muscles take time to build up force so by creating a bigger range of motion you give yourself a little bit of extra time to add an MPH or two. What they found here was that the lower velocity group showed greater amounts of knee flexion (bending your leg at the knee) from between the time their front foot landed until they released the ball. 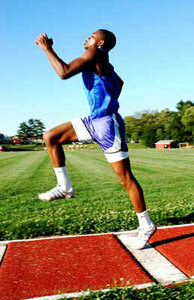 The high velocity group did they opposite where their front legs extended (straightening your leg at the knee). In the discussion portion of the reasearch paper the authors talk about how the front leg braces and stabilizes which enhances the ability of the trunk to rotate more effectively forward over the front leg. 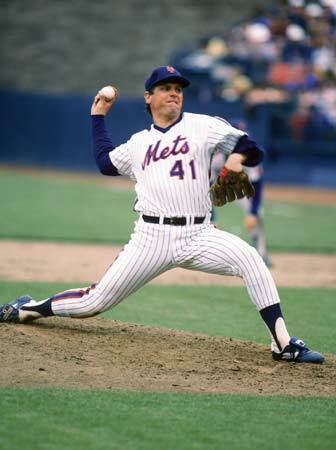 If the front leg collapses this creates a major energy leak and slows down your fastball big time. Watch the video below of the newest Texas Ranger Darvish Yu throw back when he was pitching in the Japanese league. 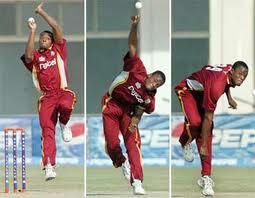 This guy throws hard and watch his front leg brace to the point where he hops backwards after releasing the ball. Another study (Escamilla et al. 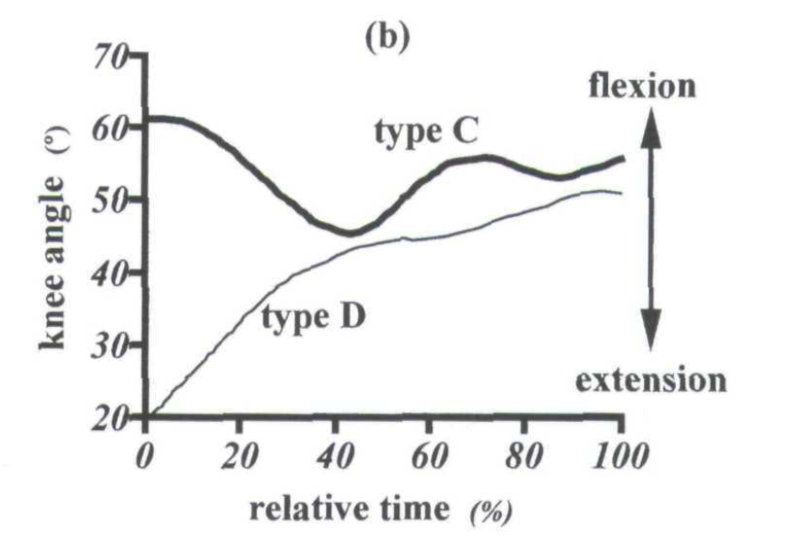 1998) showed that in collegiate pitchers began to extend their front leg just before the shoulders started to get into their externally rotated position and kept extending until the point of ball release. That front leg bracing enables you to transfer all that energy you build up from your lower half and transmit it up through your upper body. This next video does a great job of slowing things down to show how that front leg stiffens up. 4- Forward trunk tilt at instant of ball release – this one is a by product of strong front leg. A stiff and strong front leg enable you tilt your upper body to a greater degree than a weak and sloppy one. The high velocity group had a forward trunk tilt of 36.7 degress while the slower throwing group were more upright with a trunk tilt of only 28.6 degrees. Having a greater degree of trunk tilt allows you to hold onto the ball longer which again allows you to build up more force than someone who has to let go of the ball earlier because their standing more upright. When you couple this with more shoulder external rotation you really get to add some extra force to that baseball. Forward trunk tilt also enables you to let go of the baseball closer to the plate which is always a good thing because it gives the hitter less time to decide whether or not they should take a swing or not. This may not add any MPH’s to the radar gun but it make it seem faster to the hitter which is what really matters. Below are some examples of some great trunk tilts upon ball release from one of the hardest throwers ever and one of the best pitchers ever (in his prime). I hope you found this information useful and the simple fact that you know these things are important will allow you to at least be aware of how far back your arm gets into external rotation, what your front leg does and how much trunk tilt you have upon release. As far as the body height and arm length go be sure to pick the right parents and eat your Wheaties!! The “X Factor” might be secret for tapping into a major source of power which can be translated into high throwing velocities. If this sounds like something that you might be interested in keep reading. Before we jump into what exactly this “X Factor” is and how to use it let’s do a quick review of the two biggest sources of power you need to throw gas. Linear (straight line) power comes from a pitcher driving down the mound with hip leading the way followed by an explosive drive off from the back leg towards the target. This is sometimes referred to as momentum. My thesis discovered a positive correlation between an athlete’s ability to jump laterally and high throwing velocity which proves this need for linear power. I will cover this in more detail in another post. Once a pitchers front foot lands they can start adding in the rotational forces of the hips, trunk, shoulders and the arm to deliver the ball. The sum of these forces when sequenced correctly is greater than individual parts. This is often referred to as torque. This rotational force is where we find the “X Factor”. 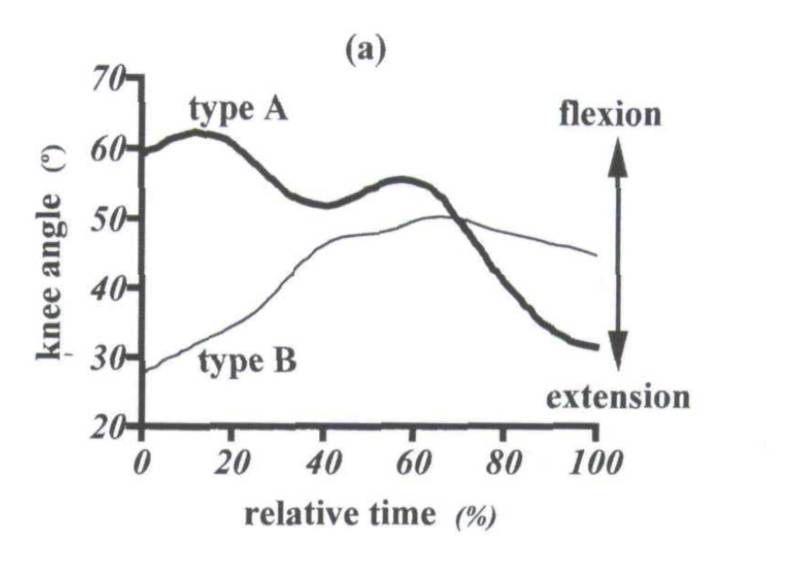 I came across this “X Factor” term from reading a study on golf which used it to describe the hip and shoulder separation which they concluded was a major factor for producing high rotational velocities that translated into longer drives. Any athlete that plays a rotational sport can benefit from learning about and maximizing their ability to separate their hips and their shoulders. 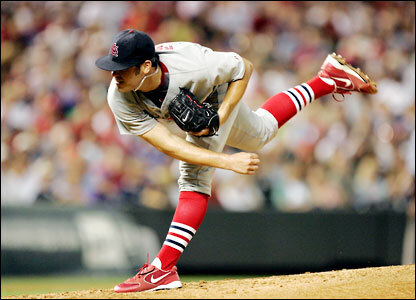 The hip and shoulder separation is arguably the most important part of the pitching motion to produce high velocities. I remember reading a Tom House book where he stressed its importance by stating that most of his guys could achieve about 80% (going by memory here) of their normal throwing velocity by throwing from their knees. Throwing from your knees eliminates nearly all linear velocity and isolates the rotational forces that contribute to throwing velocity. To get the most out of your rotational power you need to have proper sequencing where your hips rotate before your shoulders which creates this separation between the two – this would be the X-Factor. The reason why hip and shoulder separation can create so much torque and energy is due to what’s known as elastic energy. When the hips are open and the shoulders are closed the trunk that connects the two is essentially being twisted like a dish cloth. When this twisting occurs the muscles of the trunk are being stretched and begin to store elastic energy. All this stored energy ends up getting released once the shoulders begin to rotate towards the target. The more we can separate the two the more energy we can store and release. But when there’s no separation everything ends up rotating at the same time which reduces velocity and increases the time a hitter has to decide if he should lay off or drill it into the parking lot. Just knowing about this important factor allows you to watch for it when you review video of yourself at which point you can focus on this aspect of throwing. Throwing from your knees is a great way to focus on the rotational component but it doesn’t really mimic true pitching from our feet. A better drill in my opinion would be one where we get the pitcher into a stride position then have them rock back and forth a couple with the hips closed before rotating them forward while focusing on keeping the shoulders back and storing elastic energy in the trunk. But what if you can’t separate? Coaches often get frustrated when a player cannot do what they are telling them no matter how many times they describe exactly what to do. In this case a player may not have the ability to separate the hips and shoulders due to tightness and a lack of mobility. The hips need to be both strong and mobile. It’s easy to understand why we need strong hips in order to generate both linear and rotational power but you can’t forget about mobility. If the hips are tight they won’t be able to rotate as much as you would like to which will end up reducing your ability to separate. If your hips are too tight your shoulders will rotate with your hips and you will lose out on any potential elastic energy you could have created in your trunk. There was a study by Dr. Andrew Robb who is a chiropractor in Toronto that looked at how hip mobility affected both mechanics and velocity. Dr. Robb completed a fellowship at the prestigious American Sports Institute in Birmingham Alabama – this place might sound familiar because it is where the legendary Dr. Andrews works. Other members of this study include some big names in the world of baseball research like Dr’s. Glenn Fleisig and Kevin Wilk. Based on all these factors you can rest assured that this is a great study and will have some pretty good information for those out there looking for ways of improving throwing velocity. The range of motion of your dominant hip (same hip as your throwing arm) will enable you to not only take a longer stride which enables you to build more linear velocity but also allow your hips to rotate more. More range of motion allows for more time for energy to be built up while also allowing your shoulders to stay back. This is especially true when looking at your ability to abduct your hip. If you were to stand up and lift your dominant leg to the side away from your body this would be abduction. Your range of motion to abduct your hip however is limited by the tightness of your adductors. How do I Increase my Hip Abduction? Here are a couple of methods that you can use to increase your hip mobility although you could always seek the help of a qualified professional (chiropractor or physiotherapists) who can properly assess your range of motion. If you want to do it yourself your best bet is to do some soft tissue work (aka massage) then stretch. Be sure to keep a curve in the small of your back and rock back and forth. This one looks funny but you can stay in this position for a while to let those tight muscles relax. Stay strong and stay loose. Here we go with a geeky blog post about throwing mechanics. As you may or may not know I am in the midst of doing some research for my master’s degree where I am looking at the correlation of various lower body power tests and throwing velocity. As a result I am reading a lot about what the legs do during the act of throwing a baseball. Today I am taking a more in-depth look at the stride leg. If you like this post you might like my post of the ground reaction forces of pitching where I discuss the trail leg in more detail. Proper lead leg positioning at foot plant allows for optimal rotation of the hips, pelvis and trunk (Dillman, Fliesig, Andrews – 1993) which is crucial to provide the most effective transfer of energy through the kinetic chain. 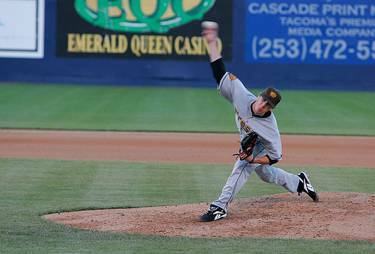 The strength of the front leg is an important factor in creating optimal throwing velocity. Matsuo et al. 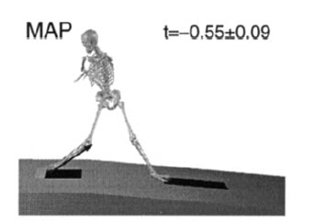 (2001) demonstrated this when they measured 12 kinematic and 9 temporal parameters between high velocity and low velocity pitchers and found that the amount of flexion and extension of the front knee was significantly different between the two groups. Matsuo et al (2001) identified four common knee movement patterns with their subjects. 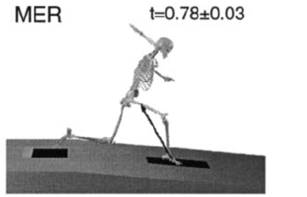 Eighty three percent of the high velocity versus 35% of the low velocity throwing group was classified as displaying either the “A” or “B” patterns which displayed more knee extension than the “C” or “D” patterns. Sixty nine percent of the high velocity group was categorized in the “A” pattern which showed small amounts of both knee flexion and extension (50-60 degrees) during the initial 60% of the time interval between front foot contact (0%) and instant of ball release (100%). From the 60% to the 100% interval time mark the knee extended from approximately 55 to 30 degrees. Only 9% of the low velocity group was classified as having the “A” pattern. At the other end of the spectrum is the “D” pattern where the front knee continued to flex from approximately 20 to 50 degrees throughout the entire pitching motion 0-100% time interval. Seventeen percent of the low velocity group demonstrated the “D” pattern while none of the high velocity group fell into this category. This supports the data presented by Escamilla et al (1998) which reported that collegiate pitchers demonstrated knee extension just prior to maximum external rotation of the glenohurmeral joint during a fastball pitch. The front knee continued to extend throughout the throwing motion as the trunk moves forward and rotates towards the intended target during which time the arm accelerates. This ability to brace the front knee allowing for optimal forward trunk tilt and rotation was identified as a characteristic of high velocity pitchers by Elliott et al. (1998). 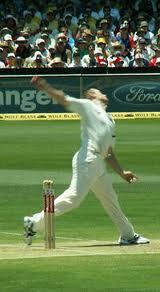 High velocity cricket bowlers have also been shown to exhibit similar front knee movement patterns. Wormgoor et al. (2010) demonstrated that greater front knee extension at ball release was the biomechanical factor that correlated the highest with throwing velocity. 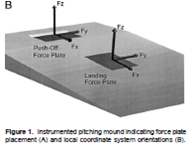 This study also reported that high wrist velocity was highly correlated with both landing anterior shear force “braking”(r2=0.70) and landing resultant force (r2=0.88) at the point of ball release. 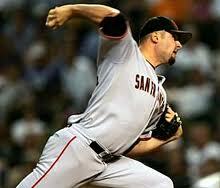 Basically the more force exerted by the front leg translated into higher throwing velocities. Campbell et al. (2010) reported high levels of EMG activity in the stride leg that exceed 100% of MVIC with the high values seen during the arm cocking (phase 3) and acceleration (phase 4). During the arm cocking phase the Gastrocnemius, Vastus Medialis, Rectus Femoris, Gluteus Maximus and Bicep Femoris produced mean values of 140, 166, 167, 108 and 99% of MVIC respectively. During the arm acceleration phase the Gastroc, VM, RF, GM and BF produced mean values of 126, 89, 47, 170 and 125 of MVIC respectively. The stride leg functions to dynamically stabilize the hip and knee joints in a single leg stance to maintain standing posture for the trunk and upper extremity to pivot about in order to produce an efficient follow through. Like I said this was going to be a geeky read but if you made it this far I thank you for your time. I am putting a big push on this thesis of mine so if you liked this kind of blog post there will be more to follow.